In 2018, a call out went out for groups across the country to raise money and awareness for #J20 defendants as well as hold discussions about the path ahead for revolutionary autonomous movements. Across the US and beyond, people responded. 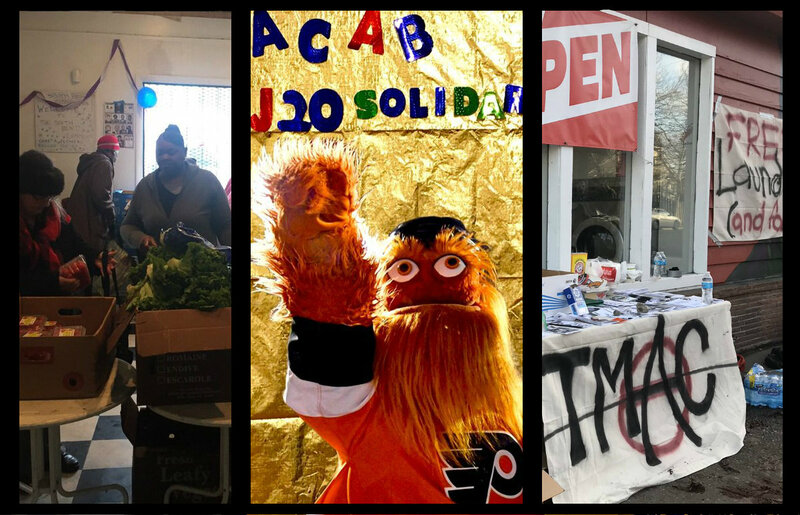 Holding conferences, block parties, film showings and events, which helped those facing repression from the #J20 mass arrests in 2017, but also brought people together, both new and old to the movement, to discuss the path ahead. On #J20 in 2019, we wanted to do the same, but to address the increasing crisis of capitalist civilization, and call on people to experiment with mutual aid and survival programs in a local context based around their own material conditions. We hoped to see people experiment with new projects and programs, but moreover, begin a conversation about what it would mean to deepen the crisis of state legitimacy by strengthening our own autonomy and ability to create dual power by meeting our needs directly, in increasingly more communal and collective ways. As the government shutdown climbs to the end of the first month, this conversation has come central, as millions of poor and working people face the very real possibility of losing access to food stamps and housing vouchers. It is possible that the shutdown will continue into March, however the longer it does, the elites know that they risk flinging society into open unrest. Just this week, federal unions will hold mass protests in an effort to push Republicans to reopen the government, and Trump is already buckling under the pressure, walking back on his former promises and now attempting to make deals with the Democrats, who in-turn, are eager to talk about further funding for border militarization. Regardless of if the government reopens, we should realize that the trajectory of this society is still very much in the same direction: to destroy and cut off social programs that were gains made during the labor and civil rights movements. Food stamps programs were being cut or attacked in many states before the shutdown and Republican officials have stated that due to the current tax cuts which mean less money coming into the State (because rich people are being taxed less) then the State must thereby make drastic cuts to medicare and medicaid. But in organizing mutual aid and survival programs doing so, we should remember that what we are attempting to do is not a form of charity, but instead, we are working to create organs of dual power that will hopefully allow us a sense of autonomy outside of this economy. Moreover, we must work to make these programs explicitly political, as well as use the spaces this projects create to bring people together in an effort to foster discussion and possible mobilization. Meaning: beyond just zines tables, using food and clothing programs to connect people to other autonomous initiatives. In a world where more and more people are turning to Go-Fund-Me in an effort to pay their medical bills and as we witness the proliferation of last minute calls for Venmo donations over Twitter to cover a friend’s rent, we need to organize and popularize our programs in such a way that understands that capitalist civilization is causing these systematic problems, and that collective revolt and refusal is needed to push back against it. History and contemporary struggles give us many examples: from the children’s breakfast programs of the Black Panther Party to the free clinics organized by Mutual Aid Disaster Relief. But ultimately, a response to the crisis will look different in each and every place comrades are able to intervene and organize in. What we can be sure of, is the very real need for the creation of counter-power and infrastructure; weapons that must be expanded upon, built up, and defended as we move forward. What follows is a roundup of events that were reported on social media on the weekend of #J20. Many other #J20 events took place that were not recorded, and some of which are planned in the future. Check out our list here. If we missed something, hit us up on social media or email us at info [at] itsgoingdown [dot] org. Tacoma Mutual Aid Collective held an event at a local laundromat, where clothes were washed for free and a meal was served. A zine table also gave out great revolutionary literature. The LA chapter of Redneck Revolt held a free community range day and firearms safety class. The Autonomous Student Network in Austin, Texas held a benefit event for the Somi Se’k Base Camp, an indigenous resistance encampment on the border. Hear our interview with them here. The Mid-Missouri John Brown Gun Club continue to organize a mobile soup kitchen in their area, complete with free warm winter items. Another storm is headed our way. Now, especially, is a time for solidarity and mutual aid. Worker’s Initiative for Liberation and Defense organized a community free store and meal which attracted over 300 people. Former J20 defendants donated thousands of dollars of money raised for J20 defense to a variety of anarchist and antifascist defense funds. Read the full statement here. Carolina Workers Collective organized a series of events, including a community meal and outreach. The South Bend Commons celebrated another weekly neighborhood free food distribution. Food distro going on now at the SBC. The future of food stamps up in the air as politicians play games with each other. Mutual Aid Disaster Relief, the Holler Network, and other organizations came together across Appalachia for a conference on how to continue forward in the coming terrain. Various groups in DC held a Really Really Free Market which was attended by hundreds. Local Philly collective Liberation Project hosted a Really Really Free Market along with a community meal. Special guest appearance from Gritty!